Hong Kong, Dec. 8 (CNA) A Hong Kong activist group took to the streets Friday to urge Beijing to release Liu Xia (劉霞), the widow of the late Nobel Peace Prize winner Liu Xiaobo (劉曉波). About 20 people attended the protest organized by the Hong Kong Alliance in Support of Patriotic Democratic Movements of China, which is also known as the Alliance, including Joshua Wong Chi Fung (黃之鋒), Hong Kong movement-based party Demosistō secretary-general; Albert Ho Chun-yan (何俊仁), chairman of the Alliance; and Lee Cheuk Yan (李卓人), the Alliance's secretary. The protesters marched to the Liaison Office of the Central People's Government in the Hong Kong Special Administrative Region while chanting "release Liu Xia" and "end one-party dictatorship." In front of the office, Ho read a joint declaration from many organizations that expressed their concern for Liu Xia's situation and urged the authorities in Beijing to respect her personal freedom. Around 2,000 Christmas condolence cards will soon be sent to Liu Xia, according to the declaration. Human rights in China have deteriorated since the 19th National Congress of the Communist Party of China, with rights protection lawyers, non-governmental organizations and underground churches being targets of suppression, according to the declaration. The liason office did not send anyone to accept the declaration and the Alliance stuck the declaration on the office's front door. 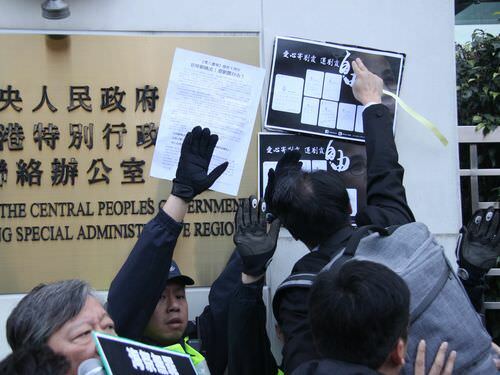 An Alliance supporter sticking a declaration on the front door of Liaison Office of the Central People's Government in the Hong Kong Special Administrative Region. Liu Xiaobo was arrested and sentenced to prison for participating in the signing of the "Charter 08" manifesto published in December 2008 in hopes of promoting judicial independence, protection of human rights, freedom of speech, religious freedom and other related matters. He died in July 2017 of liver cancer several days after being granted medical parole. Since Liu's death, Liu Xia has been under house arrest, according to the Alliance. In the 9th year remembrance anniversary of Charter 08 being published, the Alliance organized the protest against the authorities in Beijing, called for Liu Xia's release and also mourned the death of her husband.